My son has a serious Monsters University addiction. Like serious. And on the few days that I manage to avoid it, low and behold Disney puts it on TV. After an hour I felt I had the right materials to create it, so I headed home and this is what I have. 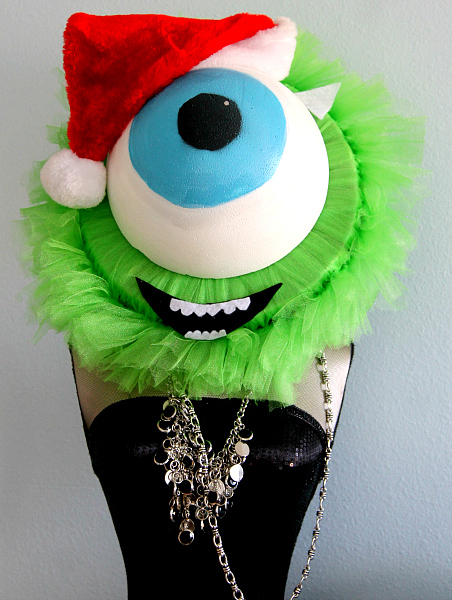 I hope my “Mike Wazowski Wreath” is just as loved by the Monsters U fan in your house! 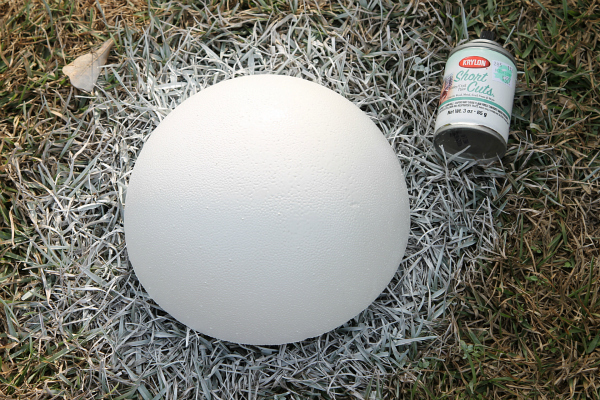 Paint for the eyeball.I used spray paint…I would suggest using acrylic paint. Less mess. 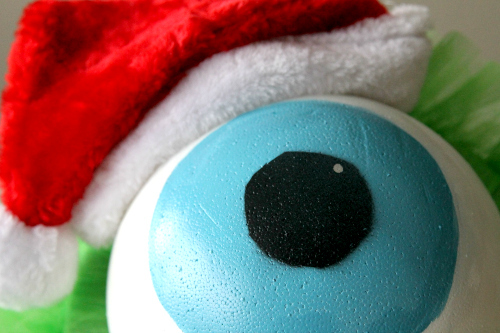 1) The first step is to go ahead and paint your eyeball. I used a complicated version of spray paint and hand created stencils for circles, but to be perfectly honest, just use acrylic paints and trace the circles right on your foam. I WAY overcomplicated it. In my head it would be “smoother” but all it did was turn my hand blue and create a lot of cleanup. I did purchase a liquid that you let dry on Styrofoam to make it more easily paint-able and tested that on a second eyeball and it made zero difference in how the paint stayed on, so I am pretty confident that you can skip it. 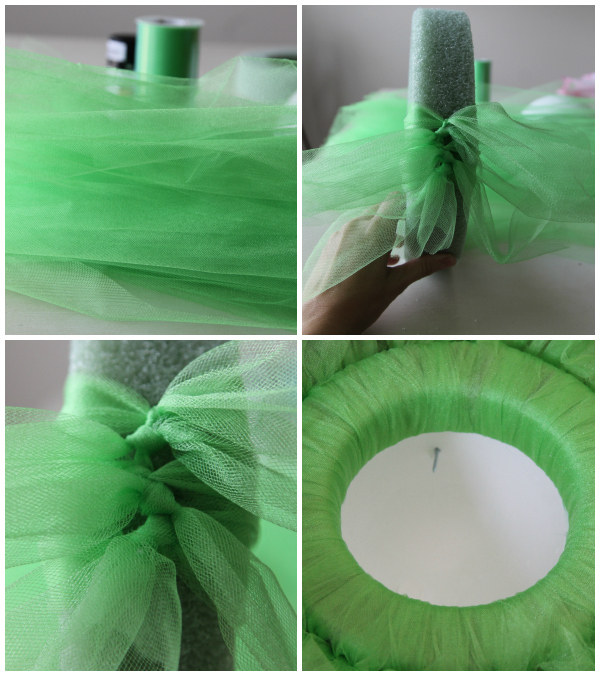 2) While that is drying, cut your strips of tulle in approximately 1 foot long pieces. 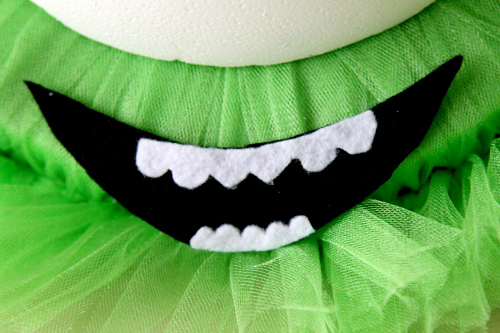 I used about 1 1/2 spools of green 6 inch wide tulle. You tie in a regular knot and make sure to fill in any gaps. I personally went back once I was done and tied all the pieces to each other as well but this was just a personal choice, not a necessity. 3) Once your eyeball is dry, you can use a silver or white paint pen to put a little sparkle dot on the eye. It brings it more to life. 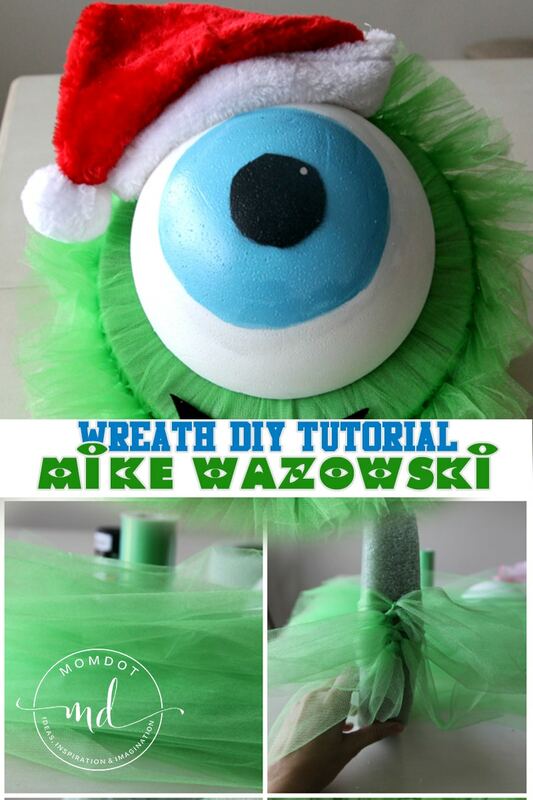 Hot glue the bottom of your eyeball onto the wreath, being careful to leave room on the bottom for your mouth. 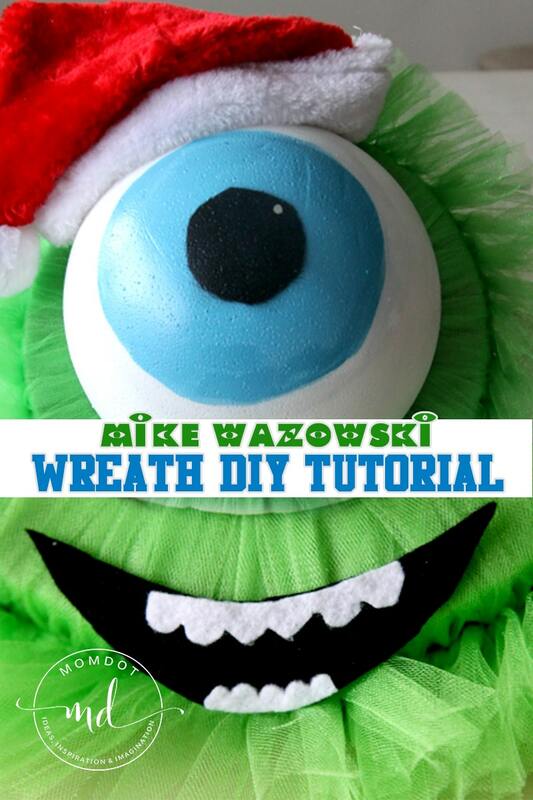 4) Cut out a mouth and teeth and hot glue to wreath. You can also create a small horn to be placed after the hat. 5) I added a cheap $2 Santa Hat and used nails to push into the Styrofoam. 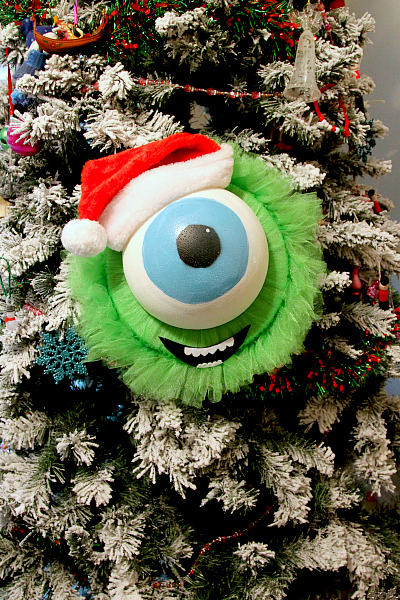 If you could find a small ball cap to put a Monsters U patch on, I think that would be just as cute. Hot Glue your horn on! I originally didn’t add this but my husband pointed out he needed one. I love this! It would be fun to mix and match colors to do it for birthday party favors maybe or something similar! This is adorable you did a great job. I pinned it! I love how this turned out! 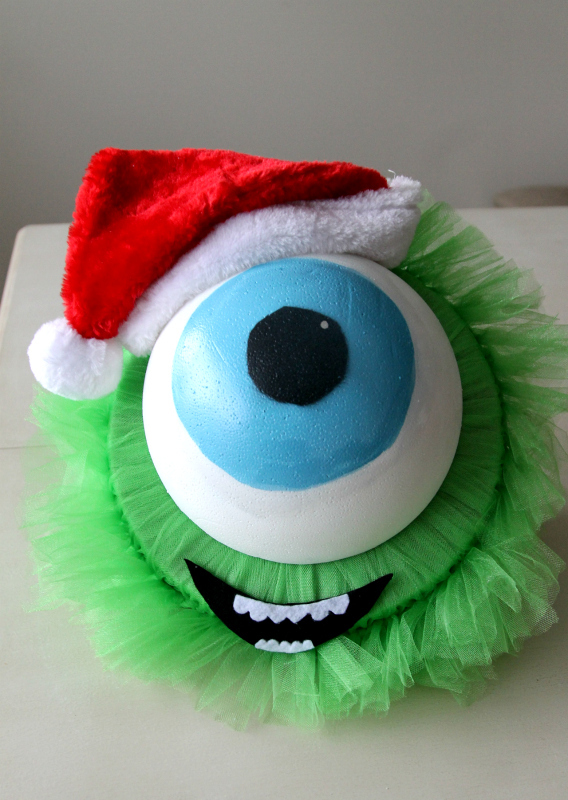 My daughter is all into Monsters U, so I bet she would LOVE one of these! I actually enjoyed watching Monster’s University, but of course I don’t have to watch it every day. At least you don’t have to hear or watch the big purple Barney! My daughter for years watched that show and I can still hear I love you, you love me in my head. It never goes away. LOL! Charlotte was into Pablo from..oh gosh..the penguin. The blue one. What was that show!!?? 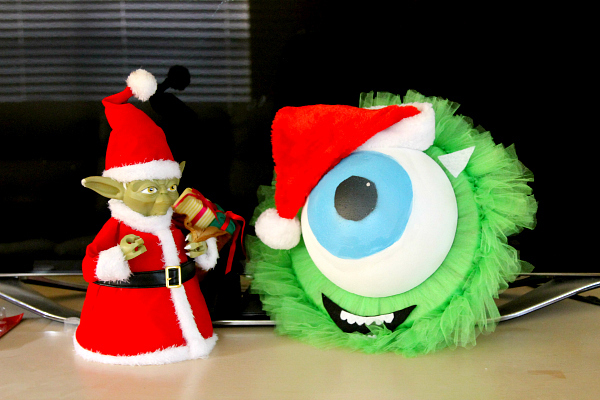 that wreath is so cute- you are one creative mom! I think my kids would love to make that on our next craft day.